Learn about the health benefits of chia seeds by clicking here. What are Hemp Hearts and What are Their Health Benefits? The name gives you a warm, fuzzy and heartfelt feeling. It makes sense. 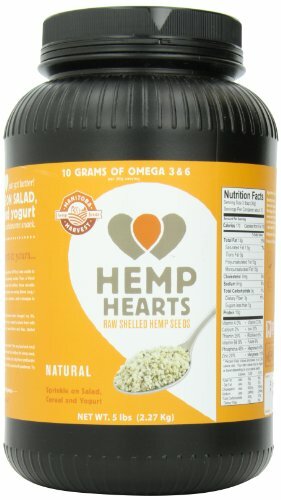 Hemp Hearts are great for your heart. What are Hemp Hearts? Quite simply, they are shelled hemp seeds. Hemp Hearts is the trademark of the major producer, but it is used in a very generic fashion, like saying Kleenex instead of tissue. I've been eating hemp hearts, along with chia seeds for some time now and have seen a significant drop in weight. I suspect it's because both products keep you feeling full for a long time. I've also noticed a rise in my energy level. That is probably a combination of the nutrients in chia seeds and hemp hearts and the fact that there is less of me to lug around. There is plenty of anecdotal information on the health benefits of hemp seeds and an increasing amount of clinical studies are taking place. People who take hemp hearts report that they feel fuller for longer. They also say they have more energy which assists in more activity and more calories burned. Because they are such a rich source of protein and valuable fats the hearts provide a major source of the body's nutritional needs. Quite simply, these little nuggets are great at keeping you regular, without any nasty side effects. I can personally attest to these benefits. Here are the other benefits as claimed by the product distributor. Numbers will be lowered within three months, reducing the risk of stroke and heart attack. Expect fewer incidences of cold and flu. A great benefit for people with diabetes and other circulatory problems. Speeds recovery from injury, illness and radiation treatment. Helps control the uncomfortable symptoms of menopause including hot flashes. May also help with premenstrual problems including bloating and mood swings. Hemp hearts have a sweet nutty taste. Use them on salads, in soups, on cereal and oatmeal. They're a great addition to scrambled eggs, pizza and chili. Most kids like the taste, but if they don't, you can add hemp hearts to muffins, cookies and breads. Pre-heat oven to 350. Mix butter and bananas together. Add hemp hearts, egg, sugar and vanilla, followed by baking soda, salt and flour. It seems like we're introduced to a new "superfood" every day. Proponents claim they will help us lose weight, fight cancer and reverse the aging process. Obviously, it pays to do your research into these products. In the case of hemp hearts, I would recommend giving them a try. You can order them through Amazon by clicking on this highlighted link. The science shows they have outstanding nutritional value. They taste great and can be easily incorporated into the diet. If you try them, please let me know what you think.